This time I would like to present something very different from the gingerbread-like Butternut Squash - Cottage Cheese Cake. It was the first pumpkin cake I've ever made and I've been baking it all over again as it's light, healthy (yeast and olive oil, no baking powder, no sodium!) and goes perfectly with a glass of milk for a quick breakfast or late supper. 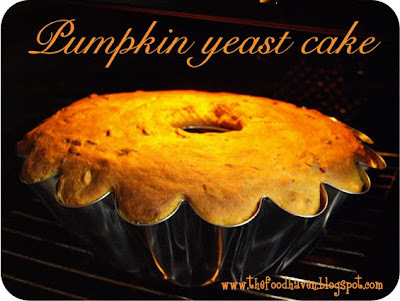 Pumpkin yeast cake is more like a bread than a cake which makes it so special for me. The recipe comes from one of my favourite cooking blogs which has been an inspiration and an example to follow since the very beginning: Kwestia Smaku written by Asia. For the Polish speakers - have a look at the original recipe. I haven't made any changes apart from adding more pumpkin seeds as the cake was simply perfect. Fits a medium size bundt pan. Prepare the yeast leaven: crush the yeast into a mug, add 1 teaspoon of all-purpose flour, 1 teaspoon of white sugar and 2 tablespoons of warm (not hot!) milk. Mix everything together, cover with a clean cotton kitchen towel and put aside into a warm place (for example: near the radiator or the oven) for 15 minutes or a tiny bit longer (the yeast need to start growing). In the meantime measure and prepare the rest of the ingredients. Sift the flour through the sieve, add the yeast leaven, sugar, salt, pumpkin puree (at a room temperature) and warm milk. Use the dough arm attachment when using a vertical mixer or simply your hands to mix (knead) all the ingredients until you can see air bubbles in the dough. Then add warmed up olive oil (up to around 30°C) & pumpkin seeds. Knead the dough for at least 15 minutes. It's necessary to equally distribute yeast and to give time to develop the gluten. If the dough is too liquid add some more flour - it will depend on how moist the pumpkin puree is. The dough shouldn't be too sticky, it should come off from your hand. Once ready, cover the surface with oil to prevent a crust from forming. (This may not be necessary if humidity is high.) Cover the bowl with a cotton kitchen towel and let the dough rise at a temperature of about 26 - 27°C. Fermentation is complete when the dough has doubled in volume which should take around an hour. Punch the dough with your fist - it expels carbon dioxide, redistributes the yeast for further growth and relaxes the gluten. Preaheat the oven to 175°C. 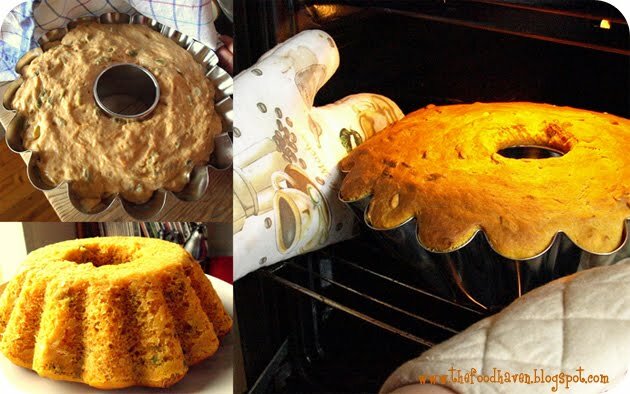 Place the dough in the bundt form greased with olive oil, oil the surface and leave for a few more minutes to grow. The time varies from 10 to 30minutes, depending how much the dough has risen previously - if it more than doubled, then none of it might be necessary. Bake for around 60 minutes. Insert a toothpick into the cake - it should come out clean. If the crust is becoming to brown, cover it with the aluminium foil during the baking. (In my oven it's usually after 45minutes.) Remove the cake from the baking form and let it cool down - it will allow the excess moisture and alcohol formed during the fermentation to escape. The cake is supposedly the best the second day after baking.